In warm climates, rhubarb will grow all year round, but in colder climates the parts of the plant above the ground disappear completely during winter, and begin to grow again from the root in early spring. It’s one of the first things to be edible in a prairie garden (along with asparagus) so I’ve always had a soft spot for rhubarb, in it’s roll as harbinger of the end of a long cold Saskatchewan winter. … mind you, my soft spot pales in comparison to John’s Cleese’s. Yes, you read that right. I’m thrilled to be the first of the 365foods family to bring Monty Python to our little corner of the blogsphere, in the form of this lovely tune called The Rhubarb Tart Song!!! Go on, go watch it. Anyways, on with the show. Having already divulged my family’s eggnog and one-bowl chocolate cake recipe, it’s time to dip back into my Grandma’s recipe book and share our rhubarb pie recipe. This is a custard pie, without a pastry top, which can be made in a matter of minutes. It’s the perfect blend of sweet and tart, and tastes great with a little whipped cream, while the pie is still warm. Makes 2 standard 9″ pies. 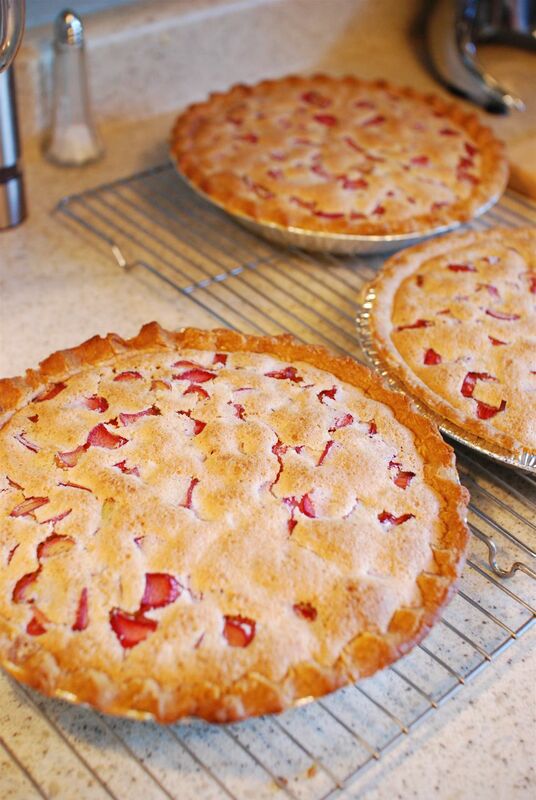 Wash and chop into 1/2 inch pieces 6 cups of rhubarb, put half the rhubarb in each pie shells (pre-bought, or homemade). Mix together: 2 c sugar, 6 tbsp flour, 1 tsp nutmeg, 2 tbsp butter, 5 eggs . Beat well with an electric mixer. Pour over rhubarb, jiggling the pies a bit to get the custard to seep down between the rhubarb bits. Like you, rhubarb was always the first food of summer, and my Grandmother’s rhubarb compote was my favourite. Can’t wait for those first spears to ripen. I’ll definitely give your grandma’s pie a try too. Mmmmm … I was there the day you made those pies. They were delicious! I think that was also the day you introduced me to rhubarb stems dipped in sugar, which I thought was bizarre until I tried it. So sorry I missed this post in January. I was introduced to rhubarb through my grandparents as well. It’s great stuff. We agree! Thanks, Elizabeth, your site, http://www.savor-the-rhubarb.com/, looks fantastic!